Schoolchildren are leaving their classrooms to protest against climate change as part of worldwide protests and this week the British Parliament found itself centre stage as eco-warriors hijacked the Brexit debates by stripping off in the public gallery overlooking the Commons’ debating chamber. 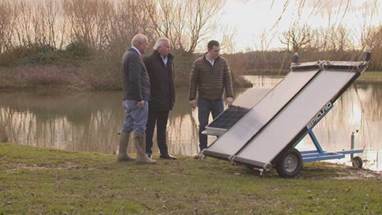 Climate change, it seems is on everyone’s agenda, including British inventor and businessman David Binns from Gloucester who has pioneered a world-first device that could help solve the world’s fresh water shortage. According to the World Economic Forum, the water crisis is the planet’s number one major problem in terms of impact upon society. The latest statistics reveal that 2,000 children die every day because of contaminated water while 3.6 million people are dying from a water-related disease. Of the world’s population, 1.6 billion are in water shortage and a further 1.6 billion are approaching that condition. The World Health Organisation estimates that currently, one-half of the developing world’s people are sick from diseases linked to dirty water and poor sanitation. Moved by the plight of those living in drought conditions in Somalia, David Binns developed a machine which converts salty seawater into drinking water. After spending five years in research and development with a team from the innovation hub Epicuro, he has unveiled his invention which relies on the sun’s energy as its only power source to distil the seawater or even contaminated water into drinkable water. Binns says he was compelled to act after seeing harrowing images on the news revealing how infants were dying unnecessarily solely because of contaminated water. His invention doesn’t require chemicals, pre-treatment of the water and contains no filters or membranes because it works purely through the use of an infrared device which harnesses sunlight to heat the boiler which is fed with impure water. The rate at which the water moves up the boiler is controlled by the Epicuro control unit. The ECU optimises the gain in temperature of the water and ensures that it boils. The science behind the invention controls the optimum temperature achieved and the movement of the steam into the condenser panel produces clean drinking water which is then discharged from the base of the condenser unit into a container for use. Each unit will cost around £2,000 based on 50,000-100,000 units being made locally per year in the country of need. In addition, Binns is also confident the scheme will create much-needed jobs in the areas blighted by contaminated water. London-based Water Aid, an international non-profit organization established in 1981 as a response to the UN International Drinking Water & Sanitation decade, has said its focus is on technologies which could “supply enough clean water for drinking, cooking bathing, washing and other basic needs”. Epicuro says it is now actively looking for corporate sponsors, partnerships and joint-venture partners to secure the agreements they require to provide everyone in the world who needs it with the kind of technology that could solve contaminated water problems.